We have forensically picked apart Deutsche Bank in a way that no other entity ever has, likely including Deutsche Bank itself. While we may not know all of its secrets, we likely now know more than almost everybody else. We will publish our findings to Veritaseum Knowledge clients early this week, but in the meantime we will put little teasers out to the public for the sake of conversation. "Why? ", you may ask. Well, everybody already knows that Deutsche Bank is a basket case, but we are showing our clients that the real short opportunities and true systemic risks lie within DB's counterparties, whom have identified and are in the process of putting share price targets on. The first forensic report on the most proximal counterparty with an elevated share price is done, and the first counterparty share price target will be published to European Bank Contagion Assessment, Forensic Analysis & Valuation subscribers within 48 hours. There are several more to follow. In the meantime and in between time, let's discuss Deutsche in detail that you will find nowhere else on the web or on Wall Street. There's no movement in counterparty risks yearly, or cumulatively, due to collateralization (where said collateral is wide open to market forces and valuations) for instruments. No control of genuineness or fineness of the physical Gold Neither the Issuer nor the Depositary Agent or any other agent of the Issuer will control the genuineness or fineness of the physical Gold held in custody on behalf of the Issuer by Clearstream Banking AG in its capacity as Depositary Agent. Oh, there's more, for those of you who believed that line "an investor is, from an economic point of view, invested in gold". The purchasers of the Notes will only acquire the rights securitised by the Notes. The purchasers of the Notes will not acquire any title to, or security interests or beneficial ownership in, the physical Gold held in custody on behalf of the Issuer. An investment in the Notes does not constitute a purchase or other acquisition of Gold. This comment excerpts the requirements of the UK Fraud Act of 2006, since the DB derivative issue was sold to UK investors. It clearly shows the material uncovered in our article can garner the label of fraud in the UK. There''s actually much more in the article if you click the aforereferenced link, but I believe many can get the message. So, where does this leave us? Well, it appears as if DB is prepping for a rash of fraud and litigation exposure. Looking at numbers buried deep within DB's more than 650 pages of financial reporting (just for the 2015 annual report), we find their disclosure of operational risk. 'Profit and loss based operational losses increased by € 3.3 billion or 133 % compared to year-end 2014. The increase was predominantly driven by the event types “Clients, Products and Business Practices” and “Internal Fraud”, due to settlements reached and increased litigation reserves for unsettled cases. The increase in the event type “External Fraud” is caused by a provision for equity trading fraud. As we drill down even further, we see even more damning information. From a frequency perspective. external fraud is the king. It happened more than any other type of operational loss, and for the year 2015, has almost matched the frequency of the previous 5 years combined. What is going on in a bank to cause such a dramatic uptick in fraud? To make matters worse, the clients, products and business practices losses (basically fraud, from our perspective) has almost doubled that of the previous 5 years - and that's just for the fiscal year 2015! The saga continues, and gets even darker. When looking at the distribution of actual losses, "Clients, Products & Business Practices" not only takes the lions share of the pie, but 2015 alone has matched the previous 5 years combined. What the hell is going on in this bank? More importantly, why is it getting so much worse? "The above left pie chart “Frequency of Operational Losses” summarizes operational risk events which occurred in 2015 compared to the five-year period 2010-2014 in brackets based on the period in which a loss was first recognized for that event. For example, for a loss event that was first recognized in 2002 with an additional profit/loss event recognized in 2015, the frequency chart would not include the loss event, but the loss distribution chart would include the profit/loss recognized in the respective period. Frequencies are driven by the event type “External Fraud” with a frequency of 44 % of all observed loss events. The event types “Clients, Product and Business Practices” contribute 42 % of the events and “Execution, Delivery and Process Management” contribute 11 %. Others are stable at 2 %. The event type “Internal Fraud” has a low frequency, resulting in less than 1 % of the loss events in the period 2015. This is unchanged compared to 2010-2014. The above right pie chart “Distribution of Operational Losses” summarizes operational risk loss postings recognized in the profit/loss in 2015 compared to the five-year period 2010-2014. The event type “Clients, Product and Business Practices” dominates the operational loss distribution with a share of 63 % and is determined by outflows related to litigation, investigations and enforcement actions. “Internal Fraud” has the second highest share (23 %) which is related to regulatory events we have experienced in recent years. Finally, the event types “External Fraud” (8 %) and “Execution, Delivery and Process Management” (5 %) can be considered minor, compared to other event types." What DB failed to point out was that although "Internal Fraud" consisted of just 1% of the occurrences, it represented 23% of the loss amount of 2015, which is ~10% more than the previous 5 years combined, which was in itself still significantly more expensive than all of the other categories. To get the heavy dirt on many of the leading EU area banks, US tech companies, and real estate concerns (not to mention the latest in blockchain technology), subscribe to Veritaseum Knowledge - in depth, extremely detailed knowledge (vs information) not available anywhere else in the world. Let me ask you a question. If you were a prospective gold investor, and were not a client of Veritaseum Knowledge, would you buy these gold instruments? Clients of Germany’s biggest bank who have invested in the exchange-traded commodity Xetra-Gold are facing problems when they want to obtain physical gold, according to German analytic website Godmode-Trader.de. “Physically backed: The issuer uses the proceeds from the issue of Xetra-Gold to purchase gold. The physical gold is held in custody for the issuer in the Frankfurt vaults of Clearstream Banking AG, a wholly-owned subsidiary of Deutsche Börse. In order to facilitate the delivery of physical gold, the issuer holds a further limited amount of gold on an unallocated weight account with Umicore AG & Co.,” says Xetra-Gold. However, despite claims that every virtual gram of gold is backed by the same amount of physical gold, clients have been refused the precious metal upon demand. According to Godmode Trader, its reader “sought physical delivery of his holdings of Xetra-Gold. For this he approached, as instructed by the German Börse document, his principal bank, Deutsche Bank." However, he was told that “the service” was no longer available for "reasons of business policy". The article went on to say it’s not yet clear whether other banks are still delivering gold through Xetra. The issuer of Xetra Gold is an entity jointly owned by Germany's Commerzbank & Deutsche Bank (rumored to be merging - Yechh! ), among others. Uh Oh! Upon acquisition of Notes, an investor is, from an economic point of view, invested in gold and thus bears the market risk associated therewith. "No correlation with the gold price"
The value of the Notes is a function of demand and supply regarding the Notes as such and not of the demand for and supply of gold. For potential purchasers of the Notes the pricing may, apart from the gold price, also be determined by other factors (e.g., the creditworthiness of the Issuer, the evaluation of these risk factors or the liquidity of the Notes). Hmmm... It sounds as if the gold is actually held on the balance sheet of the note issuers. If that's true, then this is not an investment in gold, it's and investment of a derivative of gold exposure and the balance sheet exposure of the issuer. Now, how many of the so-called "investors" of these derivatives got that concept BEFORE they bought in??? "The value of a Note will therefore not necessarily equal exactly the value of one gram of Gold at any given time." "No rights or beneficial ownership in the Gold"
Oh yeah! If I were hired as an expert witness, this stuff could get ugly.... As for now, methinks its time to go put shopping again. Tradeability No assurance can be given that the admission of the Notes to the regulated market (General Standard) of the Frankfurt Stock Exchange will continue or that the Notes will continuously be traded on the Frankfurt Stock Exchange. Consequently, there is the risk that sale of the Notes on an exchange may not, or not at all times, be possible. Become a member of Veritaseum Knowledge now, and subscribe to the knowledge module European Bank Contagion Assessment, Forensic Analysis & Valuation. There's much, much, much more to this story than meets the eye. More apparently, there are many more European banks and institutions involved - in countries you'd likely never suspect. We suspect some of them will be going pop in the not too distant future. This is from the team that called Bear Stearns, Lehman, GGP and nearly all of the significant financial institution failures of the 2008 crash. 'Nuff said! Click here to participate in Veritaseum Knowledge. We've compiled a list of six banks whom we believe the market has materially underestimated the risk of. Some of which are systemically relevant institutions with plenty of room to fall in terms of public equity pricing. The Veritaseum Introduction to Stock Valuation course has hit a homerun in walking novices investing through building an investment valuation model for althletic apparel companies, from scratch. The course compared the fundamentals of Adidas, Nike, Puma, etc. and found Adidas to be materially overvalued. This was a snapshot of the stocks at the launch of the education module. Yes, fundamentals still matter - even in a world of centrally planned market manipulation. A short position on this stock would have grossed nearly 10% in that short period of time. Those interested in taking the course and/or tweaking their own version of the model should click here to join. It was purposely priced at a mere $50 to eliminate any barriers to anyone interested in learning real world stock valuation. Conversations in our novice discussion group (Veritaseum University: Using Comparative Analysis to Value Apparel Stocks) and below will ensue as to how far Adidas has to drop before being realistically valued. German Chancellor Angela Merkel lauded Italian Premier Matteo Renzi’s economic policy as “courageous,” while signaling that European Union budget rules can’t be bent to help Italy boost growth. Merkel’s comments alongside Renzi and French President Francois Hollande hinted at one of the divisions between the leaders of the euro area’s three biggest economies as they met on Monday to plan the European Union’s way forward after Britons voted to leave the bloc. Italy’s economy stagnated in the second quarter, pushing off budget forecasts, and Renzi is pressing for greater flexibility by the European Commission. That's for sure. Brexit has not only increased uncertainty, it has promised to remove the EU's 2nd largest economy and its premier (and essentially only true) financial center. Worse yet, the sudden and extreme drop in the pound didn't make the action look nearly as apocalyptic as naysayers had promised, with retail actiivty, tourism and stocks literally jumping. This likely leads to other nations wlling to push their own individual agendas. The EC and IMF have a horrible track record of forcasting these things, reference So, Brexit. And... Czexit, Pexit, Frexit as EU referendum CONTAGION sweeps Europe amid political quake. Making matters worse, fast forward 6 years or so and the IMF/EC are not more accurate (still overly optimistic, as usual). The only real potential salve would be for them to earn their way out of the mess. That's not going to happen with negative interest rates and a recessionary economy. The banks are in bad enough shape to set off a true chain reaction. Reference our extensive report and analysis (over 2 hours worth) in Veritaseum University, aptly called European Bank Contagion Assessment, Forensic Analysis & Valuation. We have two very large sections on EU bank and financial institution contagion, and have covered 6 banks thus far. We are working on several more institutions as I type this. This is very, very important for the ECB has stress tested its banks but has refused to release the results. Don't confuse this with the stress test results from the EBA, who refused to give a pass/fail to any bank. Regulators NEVER refuse to release good news. Never fear, we're stress testing the banks for you (the same team that predicted Bear Stearns, Lehman, CountryWide and WaMu). I would be highly suspect of the EBA results for they failed to mention how unrealistic the Deutsche Bank reporting was, nor the derivative accounting of many banks that we noticed. Even more suspect is the ECB's silence. Those of you in the sell side blockchain space, expect those budgets to dry up very quickly over the next year as banks start to exhibit some real problems! All those who are interested in this topic, the European Bank Contagion Assessment, Forensic Analysis & Valuation course goes into this in depth. I wil be adding additional Deutsche Bank and contagion content over the next 48 hours as well. ...not to mention a major (the major) funding source for DB's massive derivative positions. Norddeutsche Landesbank boosted provisions for bad loans nearly fivefold to 1 billion euros ($1.1 billion), as Germany’s biggest shipping lender prepares for its first full-year loss since 2009. NordLB, controlled by the state of Lower Saxony, posted a loss of 406 million euros in the first half as it battles a prolonged slump in maritime markets, including eight years of crisis in the container segment. That compares with a profit of 290 million euros in the same period last year. “The shipping crisis, which further intensified in the first half of the year, has necessitated impairments that were higher than planned,” Chief Executive Officer Gunter Dunkel said in a statement. The bank lowered its outlook for the year, now anticipating a “significant” loss. It had projected a “negative result” in the spring. ... NordLB’s pessimistic view highlights risks at other German banks, which hold roughly one-quarter of the about 400 billion euros in global shipping loans. Under pressure to unwind sour legacy maritime assets, banks including HSH Nordbank AG and Commerzbank AG are also trying to shrink their loan books. What does this have to do with Deutsche Bank? A lot! Because everybody wants to sell these assets that aren't considered very desirable, and all at the same time, we've made a bad situation worse - precisely when DB can't afford it. "The credit risk on the securities purchased under resale agreements and securities borrowed designated under the fair value option is mitigated by the holding of collateral. The valuation of these instruments takes into account the credit enhancement in the form of the collateral received. As such there is no material movement during the year or cumulatively due to movements in counterparty credit risk on these instruments." Now, just imagine that Italy's Banco Popular is the entity that DB used to hedge it's exposure, and Banco Popular (obviously) can't pay up on every(any?)thing. DB's gross exposure become's DB's net exposure as DB's notion value and market value converge near instantaneously if (or when) market shoots off in one direction (you can likely guess what direction that would be for stakeholders, and this time around that includes depositors and bondholders, not just shareholders). What does this all mean? Well, we went through this in explicit detail and have identified no less than 6 (and we're still actively looking) financial institutions that may have passed the EBA stress tests, but have miserably failed our examination - and that's without adding in the bank contagion factor! To partake in this knowledge, join Veritaseum University and purchase the interactive research asset called "European Bank Contagion Assessment, Forensic Analysis & Valuation". Bitcoin is up 40% over the last two weeks. Whoa! The public Bitcoin network has been growing steadily since its inception 7 years ago - without much of a hiccup. That should tell you something. The “Bitcoin is bigger than Google” analogy that Balaji is using is technically accurate  and extremely interesting if you look at it as Google attempting to do the work that Bitcoin is doing (calculating SHA256) instead of thinking of the Bitcoin network as a general-purpose supercomputer. It’s not that Google cannot take over Bitcoin. They have more than $60B in cash. But they cannot do it without making huge new investments. Google’s current infrastructure doesn’t give them enough hashing power. 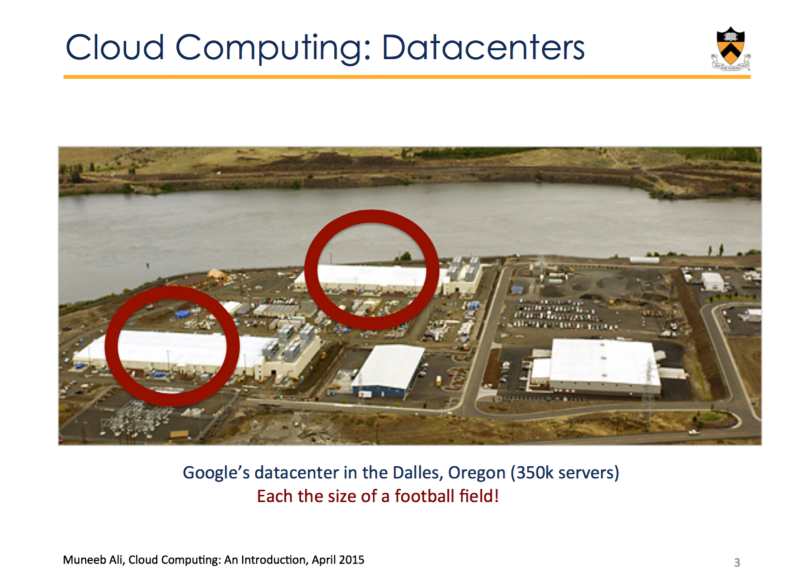 Now imagine these football field size datacenters that Google owns. If they shutdown all other operations and point all this compute power to Bitcoin, they still won’t be able to take down Bitcoin. That is a powerful visualization. This is why Veritaseum's value trading platform is build upon the public Bitcoin blockchain. It's the network effect, silly! If you want to learn more about the only capital markets system with over 45,000 tradable tickers built directly upon the backbone of the 2nd largest network in the world (the Internet is the first, for now), download the "Pathogenic Finance" report. Note: Those who can't wait until the end of this article can download "Banco Popular and the Potential for a European Bank Crisis" by clicking the link. I met with the second in charge of one of the world’s largest money center banks yesterday. It was an enlightening discussion for both of us. Bank management got to glimpse the true reality of disintermediation as this autonomous technological paradigm shift sweeps over the street, and I was enlightened to the fact that bank management really does get it – or at least will get it if they are presented with a realistic story. I have those in droves. He prefaced the discussion with stark disclaimer, “Before we get started, I just want you to know that I know that Blockchain is a bunch of hype BS!”. It appears that is the reason why I was called in. You see, from his perspective – or at least the perspective that has been sold to him – Blockchain tech is a bunch of overblown BS. The technology vendors prominent in the day have been pushing blockchains and related tech as a panacea for banks’ legacy bank-end systems. Not only am I in agreement with this CXOs assessment of the tech’s utility as sold, but even if we’re all dramatically wrong and the implementations are massive successes, it will all be for naught. This is what the CXO didn’t get until I enlightened him. You see, blockchain technology, and any properly implemented software application written on top of it, is autonomous in nature. That is, the users are empowered to retain maximum control of their assets, information and transactions. This is Peer-to-Peer technology, and to force it into a centralized, hub and spoke model (or anything similar) neuters it at best, destroys it at worst. The CXO sees blockchain tech as forced into a centralized economic model, hence sees failure, or at best mediocrity attempting to replace a legacy system. I painted a very different picture for him. Imagine this technology released in its true P2P form, not to the banks, but directly to the banks’ clients so they can use it to do what it was meant to do – eliminate the middleman! I say the same to a hedge funds, family offices and most importantly, banks. Another point that came up was the ancillary services that came with prime brokerage with a bank. It was thought that the bank’s sell side research was sought after as a value add to buy side clients, and as an extension, by us who were dismantling the prime desk apparatus. I couldn’t disagree more! We provide buyside orientated research that is second to none, and have been doing so for a decade. We've decided to release a recent report on EU banks to give those who are not familiar with us a taste of the type of research that comes part and parcel with trading on the Veritaseum platform. Read Veritaseum Blockchain-based Bank Research Hits Another Homerun - Banco Popular Shown to be Bear Stearns Redux! for a background to the report, then click here to download it directly - for free: Banco Popular and the Potential for a European Bank Crisis 1.0. Please keep in mind that the company dropped in excess of 14% after it reported earlier this month - exactly as we anticipated in this report! I have been warning Veritaseum users about the unbridled risks the ECB is taking with its banking system by slamming its yield curve - driving short and medium term rates negative. Despite the ECB's proclamations, its banking system is still quite fragile, and it is putting pressure on the barely recovered fractures, causing additional stress fissures. Before we go on, if you haven't read "It's All Out War, Pt 3: Is the Danish Krone Peg to Euro More Fragile Than Glass Beads? The Danish National Bank Infers So! and "How the Danish Central Bank is Destroying the Danish Citizens' Wealth Form Both Sides While Stressing It's Bank! ", please do. My warnings in 2010 on the PAN-EUROPEAN SOVEREIGN DEBT CRISIS will do a lot to fill in the background as well. Consumer groups in Spain and Portugal say lenders should pay up when mortgage rates drop below zero. Lenders are fighting back, with billions of dollars at stake. As interest rates in Europe fall near or below zero, lawmakers and consumer advocates in Spain and Portugal are attacking an ancient tenet of finance by insisting that lenders can owe money to borrowers. Banks in the two countries, struggling to recover from recessions that shook their financial systems, are fighting back, with billions of dollars in mortgage interest payments potentially at stake. Portugal’s central-bank governor, in a reversal, has rushed to defend the banks against a proposed law that would require them to pay borrowers when interest rates turn negative. Banks in both countries are rewriting new mortgage contracts to warn homeowners that they could never profit from subzero rates. ... Europe already has a precedent: Banks in Denmark are paying thousands of borrowers interest on their home loans, nearly four years after the central bank introduced negative interest rates. Danish banks have increased some fees to compensate but never mounted serious legal objections. In Spain and Portugal, bank executives said they would pay borrowers when pigs fly. “In no case could a client receive interest payments” because that would go against the nature of a loan, Banco Bilbao Vizcaya Argentaria SA Chief Executive Officer Carlos Torres Vila said at a news conference in April after the bank released its earnings. Portuguese bank executives are similarly categorical in private. In the few cases in which interest rates went negative, Portuguese banks lifted the rate to zero. The project would mean that banks qualify for billions of euros of initially free loans from the ECB and would get paid up to 0.4 percent of what they borrow on condition that they lend more to companies or consumers. ... "The amount that banks can borrow is linked to the amount of loans they have," Draghi said. "So a bank that is very active in granting loans to the real economy can borrow more than a bank that concentrates on other activities." ... Spanish bank executives told Reuters they welcomed the move, whereas German banks were caustic in their criticism of the ECB's steps to loosen money supply, saying it would hurt savers. This reminds me of the character on the old Popeye cartoons that used to divvy up the food by saying, "One for you, two for me, three for you, four for me..."
Consumer groups said banks are contractually obligated to stick to the terms of a variable-rate loan, which by definition rises and falls with changes in interest rates. If rates fall far enough below zero, these groups said, the banks should make interest payments to borrowers, just as they would charge clients more if interest rates rose. But the consumer groups don't seem to realize that only Veritaseum smart contracts are ironclad. EU bank contracts have an implicit malleability clause wherein the contradts are only valid if things go in favor of the banks. The terms of payment are null and void if during normal business, banks don't get their way. The Left Bloc, an ally of Portugal’s Socialist government, introduced legislation in January that would oblige lenders in such cases to pay up. As Parliament debates the bill, Lisbon-based consumer rights group Deco has instructed customers to check their loan contracts and complain if they don’t benefit from negative rates. Portugal’s central-bank governor, Carlos Costa, stepped into the fray last month, reversing an earlier position and siding with the banks. Last year, he had issued a recommendation that lenders apply negative Euribor in calculating loan interest, which would be following the rules of the contracts. Back then, Mr. Costa told lawmakers last month, he couldn’t have imagined that Euribor would keep falling. Now that it has, he argued, the banking system is at risk. Do you remember the name of the article I penned last year, this time? "Fu$k the Fundamentals! ": Negative Rates In EU Will Absolutely Wreck the Very System the ECB Sought to Save". I told you so! Portuguese banks would take a collective €700 million ($796 million) hit to their interest margins annually if the country’s six-month Euribor rate, which now stands at minus 0.144%, were to fall to minus 1%, the central bank estimates. Even if banks could limit interest rates to zero, they would lose €500 million from the difference between what they pay to depositors and what they make from lending, the central bank said. Veritaseum has new EU bank research to release, likely today. Remember how easy this was to see coming. Remember how well, our last bank research piece performed? We killed it, crystal ball-style! Reference Veritaseum Blockchain-based Bank Research Hits Another Homerun - Banco Popular Shown to be Bear Stearns Redux! During the months of March and April of 2016 we released a series of proprietary research reports indicating signficant weakneses that we found in the European banking system and released it for sale through the blockchain (reference The First Bank Likely to Fall in the Great European Banking Crisis). This was performed by the same macro forensic and fundamental analysis team that first warned about the pan-European sovereign debt crisis in 2009 and 2010 (reference Pan-European sovereign debt crisis) as well as Bear Stearns and Lehman Brothers (Is this the Breaking of the Bear? January 2008). Contact me via the info directly above this line if you're interested in purchasing the newest bank research. Banco Popuar is slated to merge with Banco Popular Milano. We have performed a deep dive analysis on this bank as a standalone entity and assessed the synergistic benefits of a newly formed combined entity. Anyone wishing access to that report can purchase it from us by contacting me, reggie AT Veritaseum dot com. We are anxious to provide macro analysis, deep dive fundamental analysis, and blockchain consulting for banks, buyside institutions and particularly investors (the clients of the money center banks). We were the first entitiy to apply for patent protection for the capital markets application of blockchain tech. We were the first entity to launch and clear blochchain based securities, and we were the guys that called the banking, real estate, European sovereign debt, and mobile tech moves of the last ten years. We know what we're doing, and we know how to apply this blochchain tech correctly - the first time around. The Central Banker's Definition of Money is Obviously Wrong, And That's Not Taking Into Consideration Veritaseum Technology and also The Real Definition of Money in a Modern Economy and The Global Currency War - USA Edition. Play with the prototype Veritaseum client here. Learn more about pathogenic finance here (video) and here (research report), and how we’re ushering in the peer-to-peer economy here – or learn more about Veritaseum here (presentation). New York: Brooklyn-based technology outfit, Veritaseum, has enabled a hedge fund to be the first to trade actual traditional capital markets value peer-to-peer through the blockchain, completely circumventing Wall Street banks and brokers and the fees that they entail. Reuters reports "Intel to cut up to 12,000 jobs as PC industry swoons". I disagree. Yes, it does appear that Intel will be cutting a lot of jobs, and quite likely ~12,000, but its not because the PC industry is swooning. It's because the PC has been undergone a paradigm shift. Personal computers have literally become handheld and Intel missed the boa, which has now sailed. Reference my writings from 2010 where I made it clear what was happening. ... Almost all the mobile products license the ARM design for at least the CPU logic. ARM has only gingerly increased the processing horsepower per-core over it's lifetime. Apple took the world by storm not only moving 1st to the 64-bit ARM design, but they did a 'custom' job. Essentially they ripped out the 85hp motor and dropped in a 225hp custom design. It's night vs day in terms of CPU performance. That on the iOS side. Android devices were beholden to ARM's standard (low horsepower) design. Until Samsung S7. Or more precisely until the Qualcomm 820 inside it, or alternatively the amsung Exynos 8890 (Samsung uses either but for different markets). To get an idea of the difference that made, check AnTuTu's TOP 10 report (1st chart). Either chips used by the S7 plus the iPhone's A9 blow the doors off everything else. What happened as of this moment is that ARM mobile devices have thrust up into or near the high-performance space that Intel has occupied. Huge shift! According to the most updated ranking of TOP-10 performance smartphone chips, Qualcomm Snapdragon 820 processor won the first place and it got a score of 136,383, which is nearly 4000 higher than that of Apple A9. Besides, Samsung Exynos 8890 also performed well, and its performance is already close to that of Apple A9. Qualcomm Snapdragon 820-powered smartphones include: Samsung Galaxy S7, Letv MAX Pro, Mi5, LG G5, Sony Xperia X Performance, etc; currently, only one smartphone is Exynos 8890-powered, i.e. Samsung Galaxy S7. Apple's design is by far the most high-powered in CPU terms, though Qualcomm is midway between ARM & Apple. But, Qualcomm/Samsung have more cores and system improvements including high-horsepower GPUs, which frankly is where the modern battle is at (games, VR, AR, mobile media editing, ...) In the last few chips from Apple, they have nearly plateaued in CPU horsepower, and for good reason. They have hit a point where it's better to spend the design hardware on other resources like more GPU, more CPU cores, etc. Apple is in Intel performance class. Though currently I believe their design (the A9) is a bit lopsided, shown by the reversion from 3 cores in A8 to 2 cores in A9. A bigger motor in the engine bay forces trading-off other hardware. As a consequence, they get smoked by Qualcomm in multi-core tests. outfits for ARM servers. Thus I have zero doubt they will continue to tweak performance and have the skills to make full Intel-class performance chips. For mobile though, the sweet spot is a bit lower. 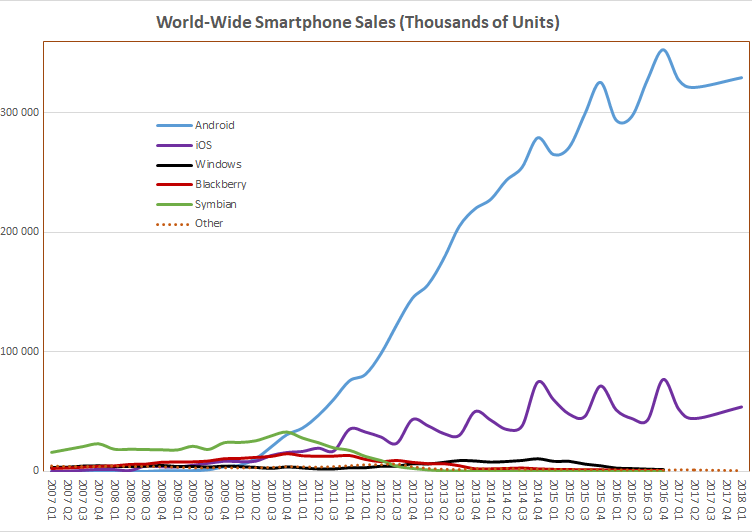 My guess is that Qualcomm's next mobile chip will be smack in the sweet spot. And that their server designs will keep encroaching on Intel's turf, which is a huge margin-compressing nightmare for Intel. every flagship Android coming out this year! What this all means, is that as of now, Apple's performance lead (in everything except single-core benchmarks) has vaporized. And their single-core performance lead cost them the top spot for more material benchmarks like GPU (see 2nd chart). In recent years, smartphones are attaching increasing importance to the GPU performance, since the GPU performance is closely related to the game performance and using fluency of a mobile phone, and it has a direct impact on users’ actual experience. Currently, the GPU with the highest performance is Qualcomm Snapdragon 820 (Adreno530), and its GPU score has already reached a score of 55,000. Samsung Exynos 8890 (Mali-T880 MP12) nearly equals Apple A9 (PowerVR GT7600). As for HiSilicon Kirin 950 (Mali-T880 MP4) that is well known to all, its GPU performance is not good enough, and its GPU results are similar to Qualcomm Snapdragon 808 (Adreno418) and Qualcomm Snapdragon 652 (Adreno510). In fact, the GPU performance is also directly related to the screen resolution of your smartphone. Currently, the mainstream resolution is 1080P, and 2K resolution has become a development trend of high-end smartphones. Without the support of strong GPU, even 2K resolution will still leads to worse user experience. team, so they can achieve exactly the hardware mix they need. One could imagine that would include vision processors like were in the prototype Tango smartphone. Is this what happened to Intel? Whoa!!! You can't say I didn't tell you so at least 6 years in advance, through. If you're still bearish on Intel relative to arm manufacturers or GOOG and Apple, here's how to use Veritaseum to create a custom contract to monetize your thesis even if the equity markets take a dive, or spike due to QE 25, or something like that. Go short INTC and pay for it with GOOG or QCOM exposure. The bold can throw 10x leverage into the mix. Anyone interested in knowing more about the first company to issue public smart contracts traded on the public blockchain, or the company to file the first patent applications for the use of blockchain tech as applies to capital markets (yes, we were the first) or the only company that is creating on-ramps to the blockchain-powered peer-to-peer economy (think peer-to-peer capital markets vs. the legacy hub and spoke model) should contact me directly (reggie AT veritaseum.com. We have a lot to talk about.